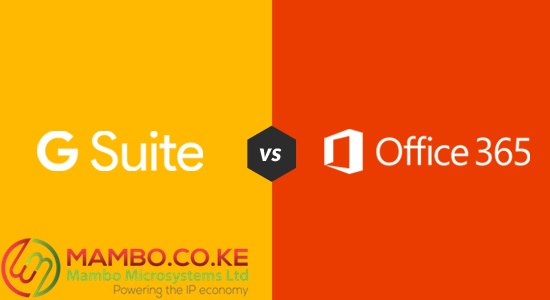 Home / Blogs/Which is best for business: G Suite or Office 365? G Suite refers to the Google Apps as its formerly known productivity suite for office. Specifically, small and medium-sized business. It includes office communication apps like Hangout and Chat, as well as others for work such as Google docs and spreadsheet. Since its launch, it has been customized severally to look and perform better. From their email service to their group calendars. This productivity suite is excellent for teamwork as many tools have been modified to accommodate team collaboration. Office 365 is a Microsoft productivity suite targeted for both enterprise and home users. There is a friendly student package, and the enterprise solutions also accommodate small business owners with the packages available for up to five users per PC. It also works across different platforms such as iOS and Android. It is available via a subscription fee paid on a monthly or annual basis. G Suite also has a paid packaging service for business and premium users, as well as a free offer. This is one way they differ from Microsoft. Using a cloud productivity suite saves you the expenses of maintaining software licenses and installations as well as managing vendors or employees for an IT department. While using cloud services, you can access your work anywhere at any time given you have a smart device. This is why many businesses are attracted to cloud applications today. They are inexpensive yet very effective and powerful tools. Now both offer competitive pricing, which is similar. However, for Google, their enterprise and business plans come with unlimited storage for 5 users and over. Whereas, Microsoft offers all their plans with 1 TB of storage which is a lot but not unlimited. Google also offers free voice calls via hangouts and google voice. The same is not available for Microsoft which only offers skype calls for the business plans and premium, where the users have to buy Skype credits to place calls. There is that advantage Google has over Microsoft. For any startup entrepreneur spending is very important, hence pricing is a factor when choosing the best plan. When it comes to email services both suites allow you to craft your own professional emails. When it comes to Gmail, you can create your own domain name by registering it which will be available to 30 unique users. As for Microsoft, the same is available but with unique aliases for up to 400 users. Microsoft uses Outlook as the mailing app which is quite popular as a desktop option. When it comes to Google, they do not have a popular mailing app but instead, customers can use Thunderbird or even Outlook for this service. Google has a superior search feature to locate files and shared folders. It is also very easy to share files with others. One can even make them available for editor download with another user. If you are using a PC with Windows 8 or 10, one drive comes integrated with those operating systems. Which makes it even easier to save and share files on the cloud. When it comes to the apps, Google Hangouts allows for video conferencing just like Skype and additionally free SMS and voice calls in the US and Canada. Finally, the security used on both Google and Microsoft is impressive. Google incorporates security measures such as automatic detection of suspicious activity, phishing, and other hacking attempts. Google also allows administrators to ser different policies to prevent unauthorized access to your admin console. It also comes with a data leak protection and you can use the two-factor authentication and enforce among all the users. For the office applications. Microsoft has enabled multiple factor authentication for all user passwords. It also uses its own AI tools to learn each user work habits to be able to detect suspicious activities and flag them. After this comparison, I would go for Googles G Suite because of ease of use and more value for more on an affordable scale. Microsoft is also very functional, but a bit pricier and more complex to use for a small business or users who are not familiar with their office products. For now, the choice is yours!